There’s lots to choose from but our first choice is the magnificent Old Town. Tucked away on the southern edge of the island, the whitewashed buildings and stunning harbour are overlooked by a 14th century citadel. 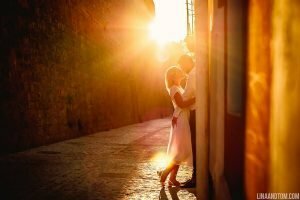 You” find plenty of sunny spots and hidden nooks and crannies to capture the most romantic of photos. It’s the most laid back part of the island, perfect for small weddings, engagement shoots or post-wedding photos. Next up is Es Vedra, an uninhabited isle off the south west tip of Ibiza. We hear new legends about it every time we go, everything from it being home to sea nymphs to a hotspot for UFOs. 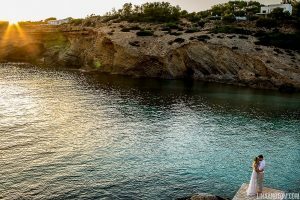 Either way, its location on the edge of the Med provides gorgeous scenery from Ibiza itself. 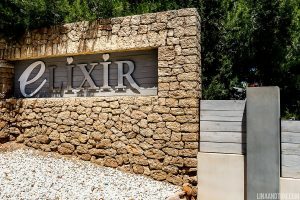 If you’re looking to get married overlooking Es Vedra, we’d definitely recommend the Elixir Ibiza wedding venue. 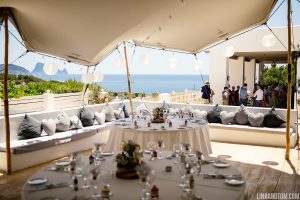 We shot Sam and Nick’s wedding here and loved the sea view from the terrace and the perfect quiet beach down below. It’s a classic but we love, love, love Cafe del Mar. 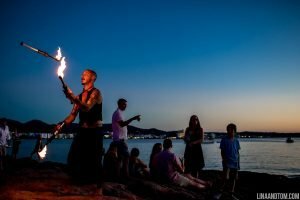 This world famous chill out beach bar and clubbers mecca is the best location to watch the famous Ibizan sunsets. 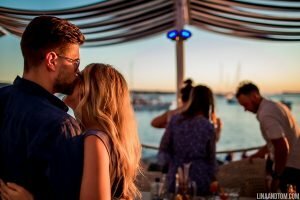 It’s the perfect spot for pre-wedding drinks, or post-wedding recovery should you turn your destination wedding into a holiday. 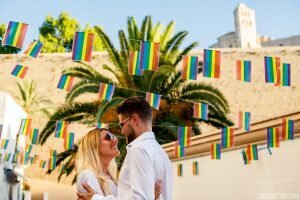 Heatwaves are common in Ibiza and other Mediterranean destination wedding spots. Rather than opting for the princess ball gown, try something floatier and more breathable. It makes the hot weather so much more bearable but you will obviously still look gorgeous. Plus, it’s ideal for dancing – no changes required! 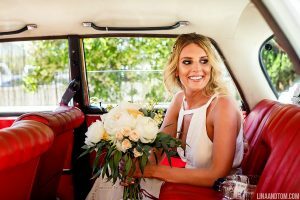 We loved Sam’s Grecian style Temperley wedding dress for her Ibiza escape, sticking to a simple hair style and fresh makeup also kept her looking her best all day. 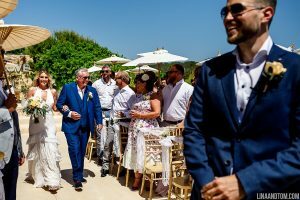 Nick, the groom, also chose a simple lightweight linen suit instead of top and tails or heavy waistcoats – far more comfortable. 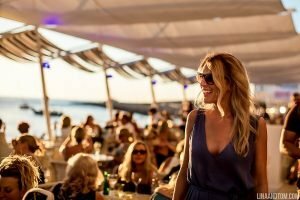 Sunset or golden hour makes for incredible photographs, especially when matched with the gorgeous Ibizan scenery. 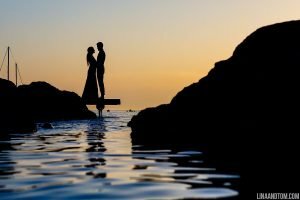 A sunset ceremony might be dreamy, but it will be dark when it comes to your photos, and having them earlier means forgoing the sun at its most beautiful. A late afternoon ceremony before sunset is ideal. 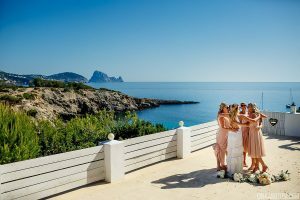 Imagine your destination wedding photography overlooking Es Vedra at golden hour? 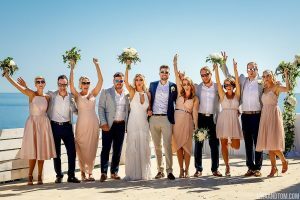 We’ll be first in line to be your Ibiza wedding photographer! Late afternoon ceremonies are also cooler, making it more comfortable for you and your guests . 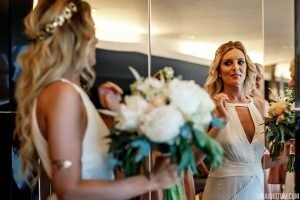 This also gives you more time to get ready before your ceremony, or sleep off the hangover from pre-drinks at Cafe del Mar. If you’re worried about having a shorter wedding day, why not extend it by a few days? A celebratory poolside BBQ the next day, with plenty of relaxing on the sun-loungers is a perfect way to let the party continue. 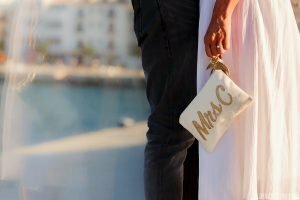 We couldn’t leave without giving you some tips for choosing an Ibiza wedding photographer. Firstly, we recommend a finding photographer local to you or at least in your home country. Why? 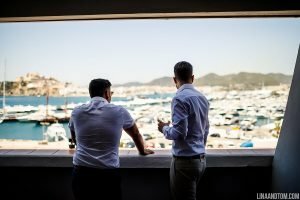 Meeting and getting to know your photographer in the build up is so important, they’re the supplier you’ll spend the most time with and the ones you should have a spark with. That makes for the most natural, fun photos! 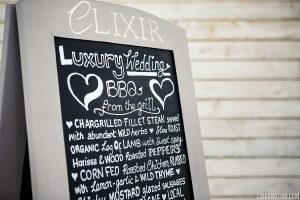 While we don’t want to take away from the local photographers, we’ll shoot your wedding feeling the same magic you do. 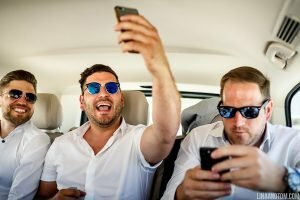 We will feel the excitement of being away in a special place compared with a photographer who has shot there day in day out. Let’s adventure together. Next, choose a photographer with destination wedding experience. 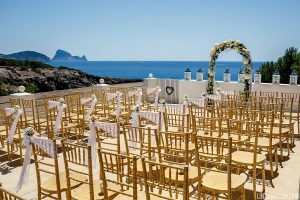 We’ve shot weddings all over Europe including Ibiza as well as travelling in North and South America. 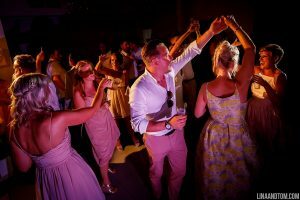 We’ve also shot hundreds of UK-based weddings, and we can tell you that they are very different from a destination wedding. Each wedding we’ve shot builds our experience, which lets us give you the very best memories from you day. 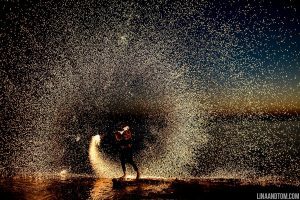 Every photographer wants to shoot abroad it seems, but not every photographer can produce their best work in the extremes of weather – yet we thrive on it! 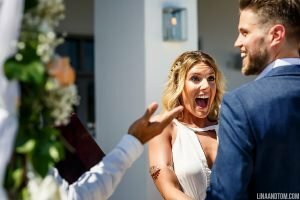 Finally, choose a photographer that offers full destination wedding coverage, not just the wedding day. 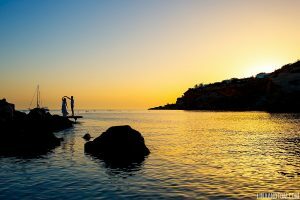 We offer pre and post wedding coverage in our destination wedding photography prices. 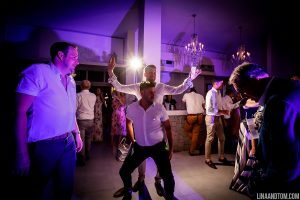 That way you won’t miss re-living the moments of those fabulous sunset drinks at your favourite beach bar, or the post-wedding wander among the landmarks of your destination. 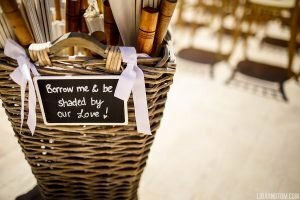 Need more help planning your destination wedding? We’ve written destination wedding planning checklist. Hurray! 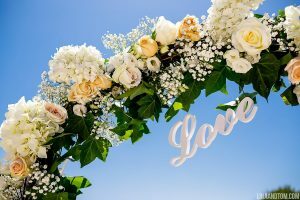 It contains all the advice you need to plan your destination wedding. Click here to Download it for Free. 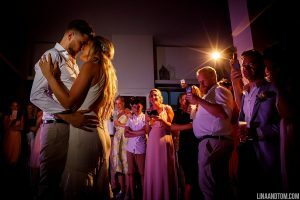 Want more advice about wedding photography in Ibiza? Get in touch to chat about your plans!